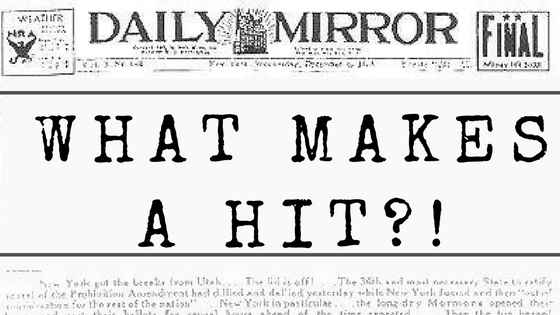 Welcome to our newest series, “What Makes a Hit”! Over the past two years, Rachel Fernandes, one of the Gershwin Initiative’s undergraduate assistants, explored some of George and Ira Gershwin’s most popular Broadway songs—and a handful of near-misses—in order to answer the question: what makes a hit? In this introduction to the series, Rachel examines some characteristics that feature prominently in the Gershwin brothers’ most successful songs. What is a “hit” song? The Webster-Merriam Dictionary defines a “hit” as “something that is very successful”—typically measured by the profit generated by, or the lasting effect of, the song. George and Ira Gershwin wrote countless tunes, many of which endure today. In this series, I will analyze four of the Gershwins’ songs—“’S Wonderful,” “Funny Face,” “Cactus Time in Arizona,” and “I Got Rhythm”—in order to discover why each piece was or was not ultimately successful. The success of each song will be determined by the work’s enduring popularity and whether it was re-recorded by subsequent artists or used in another Gershwin musical—a mark that the song could survive outside of its original context. Over the course of these posts, we will investigate the characteristics of the Gershwins’ songs to discover what makes a hit. “[George’s] most popular melodies contain [an aggressive quality], while those I consider to be more moving, and more interesting musically, are, for the most part, his less commercially successful, more graceful, delicate melodies…”. On the other hand, Allen Forte, Richard Lalli, and Gary Chapman argue that George’s more complex, surprising melodies, such as “I Got Rhythm,” were more memorable. While the Gershwins had both simple and complex hits, I believe that simple melodies were a bit more successful. In addition to melody, jazz specialists Arnold Shaw and Ted Gioia posit that the rhythms of the Gershwins’ songs are part of the reason why they became so popular. George’s music makes considerable use of syncopation, a rhythmic device that places stresses or accents where they wouldn’t normally occur—typically onto weak beats. Syncopation came into American music in the early 1900s with the popularity of ragtime and was an important feature of jazz of the 1920s and ’30s. George’s use of syncopation added rhythmic spontaneity that evoked the improvisatory quality of jazz. Rhythm and melody weren’t the only characteristics of the Gershwins’ music that attracted audiences; George’s use of sophisticated harmonies, the musical structures that underpin tunes, was also captivating. Music scholars Allen Forte and Richard Crawford argue that “beautiful” and “enriched” harmonies are two features that made George’s music so successful. I would also argue that in the cases of the songs that I analyzed—and in many of George’s successful songs—simple melodies had to be paired with rich, complex harmonies and orchestration in order to create a hit. These musical aspects—enticing rhythms, simple melodies, and sophisticated harmonies—are certainly present in George and Ira’s most popular music, but hit songs are more complicated than that. One factor that must be accounted for is George and Ira’s creative collaboration. 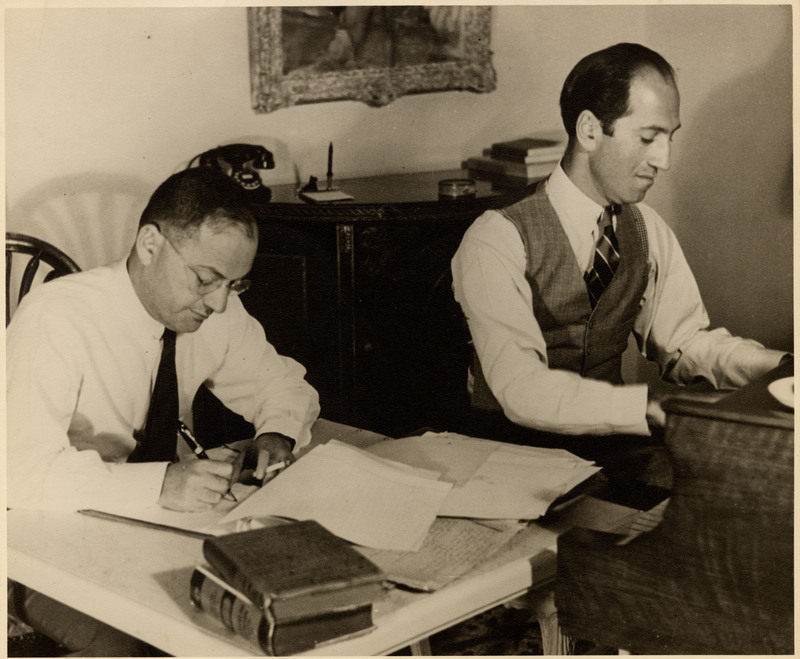 The Gershwin brothers’ partnership is the stuff of popular music legend, and according to scholar Howard Pollack, their most beloved songs demonstrate that Ira was “marvelously attuned to his brother’s music.” Ira devoted endless hours to making sure his lyrics fit, no matter how difficult George’s rhythms. The brothers’ close collaboration allowed them to produce songs of the highest quality, and I believe that it was a significant contributing factor to their success. Musical characteristics are not the only elements that led to a hit song. If a Gershwin song could be taken out of its original context and thrive after it was reinterpreted by a new performer, then it had a much better chance of captivating future listeners. The whims of subsequent recording artists, as well as the song’s cultural context, often contribute to how a work is received by the public. In the next post of this series, I will be focusing on the historical context of the Gershwins’ success, since George and Ira’s songs and how they were accepted can tell us much about the culture of the 1920s and ’30s. Join me to learn more! Crawford, Richard. America’s Musical Life: A History. New York: W. W. Norton & Company, Inc, 2001. Forte, Allen, Richard Lalli, and Gary Chapman. Listening to Classic American Popular Songs. New Haven, CT: Yale University Press, 2001. Pollack, Howard. George Gershwin: His Life and Work. Berkeley: University of California Press, 2007. Shaw, Arnold. Jazz Age: Popular Music in the 1920s. New York: Oxford University Press, 1989. Wilder, Alec. American Popular Song: the Great Innovators 1900-1950. New York: Oxford University Press, 1972. I love the discussion of what makes a hit, because sometimes it feels like an unanswerable question. It’s much easier to spot what took a song out of hit contention, and usually it’s a quirky, non-love song lyric that makes sense in the show it was written for but not compelling for a cabaret singer to perform. Songs with lyrics like those of “Come to the Moon,” “Tum On and Tiss Me,” “Limehouse Nights” and many more like them, don’t stand a chance of ever becoming a hit with the universal appeal of a song like “They Can’t Take That Away From Me”.